All of our CIDA international internship positions are now filled. Please check back for any future opportunities or visit the CIDA website. See below for information on our past CIDA international internship postings. Each year, REAP-Canada offers young Canadians an opportunity to gain exposure in the fields of sustainable agriculture and international development through the Canadian International Development Agency's (CIDA) International Youth Internship Program (IYIP). IYIP is available through the financial support of the Government of Canada provided through CIDA and is designed for Canadian graduates as part of the Career Focus stream of the Government of Canada's Youth Employment Strategy (YES). Canada's YES provides Canadian youth with tools and experience they need to launch successful careers. These internships are paid positions. To contribute to the advancement of CIDA's mandate (reducing poverty, promoting human rights and increased sustainable development) and to meeting CIDA's priorities for Official Development Assistance. 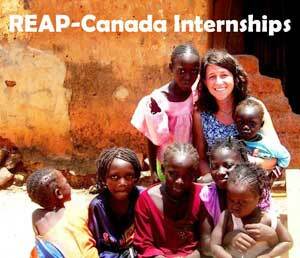 REAP-Canada's internship includes a 8 week term in Canada based in Ste. Anne be Bellevue, Quebec with REAP-Canada, where the interns learn about and support our sustainable development program and approach. This is followed by a 5 and half-month placement in the Gambia or Senegal where they are based with one of our local southern partners. The overseas term also includes one month of intensive language training and cultural immersion. Additionally, there is a pre-departure orientation workshop and a debriefing workshop and a final two weeks of training at REAP-Canada where interns will learn job search skills and how to follow up on entrepreneurial opportunities. To learn more about our CIDA youth internship positions, please contact us at info at reap-canada.com. You can also read about past intern experiences by viewing the internship section of this website.